“How should we structure our council?” That’s a question frequently uttered by people working with food policy councils (FPCs) And, as with so many questions out there, there is not a clear and easy answer. Decisions like this depends on many factors such as the mission and goals for the group, who is involved, what resources are available, policy objectives and the culture of the group. Deciding the structure will be one of several decisions you make in the process of organizing. Your structure might also be influenced by your relationship with government. By clarifying the mission and goals for the council, you attract members to get involved. Having a clear structure helps members understand their role of the council in making decisions about food policy. When FPCs began forming decades ago, groups picked between being inside or outside of government. Now most groups select a hybrid model, which allows them to take several factors into account as they work to change the food system. Form follows function. The descriptions below attempt to delineate some of the options out there. Independent Coalition: These are self-organized groups that sometimes begin their work because of a specific issue. 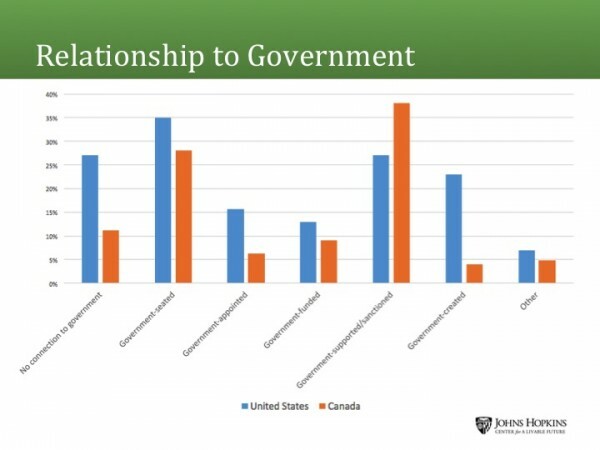 Their relationship with government varies from having no connection to government to having government funding or government employees as members. Leadership typically emerges from the group. A nonprofit may play a lead role in organizing the group, but the coalition does not have nonprofit status in and of itself and is not part of a nonprofit organization. Policy and program objectives typically emerge from the members. Benefits: Opportunity for the community to take the lead or play a key role in setting the agenda. Policy work tends to be issue-based and practical, with large constituent base. Fewer restrictions on ability to advocate for policy change. Flexibility engages a broader membership. Challenges: Sometimes resource-constrained or entirely volunteer-run. More difficult to maintain or sustain efforts if there are insufficient resources. Taking a systems approach may be difficult because of issue-specific nature or lack of expertise among members. Sometimes an anti-government bias can hinder your ability to conduct food policy work. Part of a nonprofit organization: This model may have a leader who is part of a nonprofit working on various food, hunger or agriculture issues and the FPC becomes a project of that nonprofit. The nonprofit may provide funding or staff support for the FPC. Government employees may or may not be members of the council. Benefits: Quick start-up because the council is building from an existing structure. Usually there are some in-kind contributions from the nonprofit. The council is able to fundraise because nonprofit provides fiduciary oversight. Small percentage of time can be dedicated to lobbying. Greater credibility and notoriety occurs earlier on due to affiliation with existing organization. Challenges: May be difficult to expand the scope of the group if it is in conflict with the nonprofit’s mission. It is sometimes difficult to operate using a systems perspective with this structure. Focus on policy may be limited or not encouraged if there is a misunderstanding about advocacy rules for nonprofits. Connection to and support from the nonprofit may waver if leadership changes within the council or nonprofit. Membership may rely too heavily on the nonprofit and not take on leadership roles or feel ownership over Council. Housed in government: Funded or staffed by government employees, this structure lends itself to a focus on policy because of the direct connections to policymakers. These groups can be formed through a resolution, executive order, or another form of agreement. Membership and leadership is usually appointed. At the city level, an elected official may create a position that reports to a mayor or other high-level official and that position will inform, organize or execute a government strategy for food. These positions can be embedded in a department of planning, public health, sustainability or economic development. At a state level, positions that focus on food policy may be embedded in a department like the Department of Agriculture or Health. Some of the food policy director positions at the city level refrain from a council model and work primarily within government; others convene an advisory group of stakeholders to help influence their work. Benefits: Close relationship with government means strong potential to work on policy. There is also access to financial and human resources data sources, and a broad range of government departments. Some increased credibility being affiliated with government. Challenges: Change in government leadership may result in termination of work, which could lead to a diminished interest in food policy issues. Priorities are usually determined by elected officials or government staff, which may or may not seek input on those priorities. Can be difficult to develop community leadership/ownership. Nonprofit: Typically, due to the significant resources (i.e., usually multi-year funding) dedicated to their work, the FPC may choose to start their own nonprofit. This structure is sometimes selected because there is not a nonprofit available that is willing to serve as a fiscal agent or they have not fully researched the 501(c)(3) options. A full-time coordinator or director is almost always hired to oversee the council. These groups range from having no relationship with government to having government employees as members, or receiving government funding. Benefits: Level of resources is usually correlated with ability to make progress on policy agenda. Able to develop a policy or program agenda that is based on what is needed at community level. Challenges: Application process for nonprofit status is onerous. There are associated costs and obligations with operating a nonprofit. May not have direct connections with elected officials, which can hamper policy progress. May run up against lobbying and advocacy restrictions. 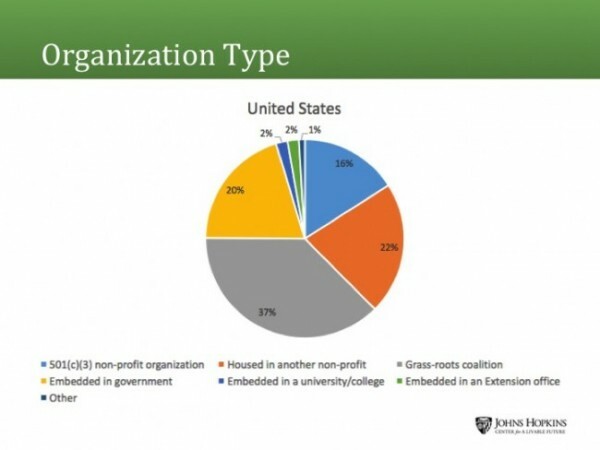 Embedded in a university/college or are part of an Extension office: A small number of groups are housed or supported by a university, or are part of the Cooperative Extension office. This support typically includes: administrative support, grant management, and staffing. Benefits: Access to resources including grant management, content expertise, administrative support and students who are looking for research projects, capstone projects, and volunteer opportunities. Challenges: Some Extension offices discourage advocacy. There is bureaucracy associated with large institutions. Every year we update the food policy council directory and ask groups to select the structure description that best describes their council. Here are results from the 215+ Food Policy Councils that completed the 2015 directory update. The lines between these are blurry, so keep in mind that there is a continuum of possibilities out there and these trends reflect the nuanced approaches to council structures. The structure they established was not correlated with their connection with government. In other words, you can and should seek out a relationship with your local or state government regardless of your structure. If you decide your structure isn’t working for you anymore, change it! Organizational development is a dynamic process. You should always re-evaluatie and modify your organization in order to meet your current needs. Forty-three percent of the FPCs in our directory noted that they had changed their structure over time. Want to share your stories about how your FPC is structured, how it has it changed over time, what would you do differently….? Citations: Johns Hopkins Center for a Livable Future (2015). Food Policy Council (FPC) Directory. MacRae, R., Donahue, K., Council, T. F. P., & Council, V. F. P. (2013). Municipal food policy entrepreneurs: A preliminary analysis of how Canadian cities and regional districts are involved in food system change.